The Declaration of Independence famously alters John Locke's celebration of "life, liberty, and property" to "life, liberty, and the pursuit of happiness." Those differing values have been in tension ever since. When push comes to shove, whose property, and whose happiness, matters more? What qualifies as "property" or "happiness"? And who gets to decide? Current scholarship mostly finds 20th-century evangelicals to have been quite happy with the acquisition of property. Without big business, there would be no evangelicalism as we know it. But these two cultural forces did not always get along so nicely. Heath Carter recently reminded us that evangelicals championed labor unions in the late 19th and early 20th centuries. Legal historian John W. Compton, looking even further back in history, found that evangelicals once hacked away at property interests in America, ironically paving the way for progressive interpretations of the Constitution that evangelicals and other conservatives now despise. And by hack, I do mean hack. That's Carry Nation on the cover of Compton's book, wielding a Bible rather than her more iconic saloon-smashing hatchet. 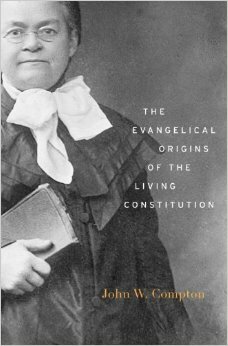 The Evangelical Origins of the Living Constitution (Harvard, 2014) might not naturally join conversations about evangelicals and business. 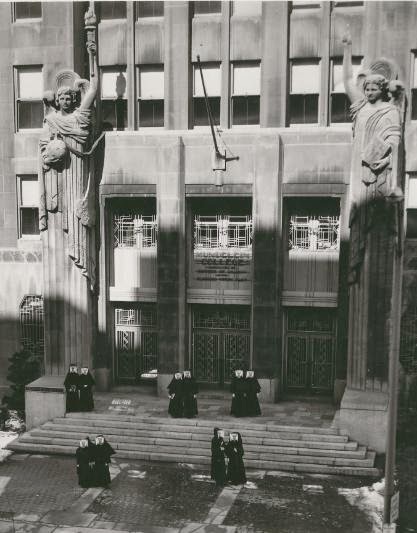 Compton sought to intervene in a different discussion, the legal-historical and political debate about why the Supreme Court in the 1930s started interpreting the Constitution as a work in progress rather than a document set in stone. A longstanding explanation stated that extreme political pressures in the 1930s, coupled with foreign ideas from the likes of Charles Darwin and G.W.F. Hegel, produced a sudden, stunning legal revolution. Revisionists argued that upheavals in the American economy contributed to the change, and that it built slowly, in step with the Industrial Revolution. While granting some of these points, Compton put religion in the picture and tied the legal innovations of the New Deal era to the social transformation begun by the Second Great Awakening. Harvard Law Review did a better job of analyzing--and affirming--Compton's legal scholarship than I can. Instead, after a brief summary, I'll offer a few thoughts on how this book can speak to the "business turn" in our field. In Compton's narrative, despite Thomas Jefferson's praise for the pursuit of happiness, the framers of the Constitution laid the foundation for a "commercial republic," betting that Americans who couldn't agree on much else--and who, at the time, weren't very religious--could be collectively inspired by the pursuit of property. If that pursuit meant selling intoxicating liquors, or lottery tickets, or human beings, oh well, a buck's a buck, and American law would defend your right to it. Evangelicals galvanized by the Second Great Awakening rejected this bargain. They cared more about happiness, in the eudaimonia, social virtue sense, and they wanted America's laws to enforce their vision. As Compton put it, "Where the framers had sought to protect established property rights and insulate interstate markets from excessive state and local regulation, the aims of the Protestant reformers [he means evangelicals] were precisely the opposite: to constrain property rights and interstate markets in the name of the public good" (21). There are so many ways to get from there to what evangelicals today are, and are not, saying about vice, prosperity, unscrupulous businessmen, and the regulatory authority of the state. Go to it, historians.